Critical Bench Review (2019) - 50 Pounds More in 10 Weeks? 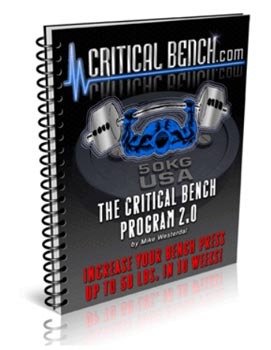 Critical Bench Review – 50 Pounds More in 10 Weeks? Mike Westerdal says he was a 150 pound weakling who can now bench press more than 400 pounds. 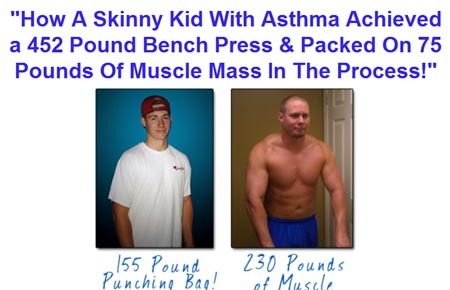 He also says that his methods have allowed him to add 75 pounds of muscle to his frame. That’s impressive, and he says that his Critical Bench program can do the same thing for you. Mike says the key to all of this is the bench press and it’s a common area of focus among bodybuilders and workout freaks. So he’s devised the Critical Bench program as the primary means of helping you build muscle and increase your performance. I thought I’d take a closer look and see if the program is all it’s cracked up to be. Is Critical Bench a scam? Click here to visit the Critical Bench Website. Read on for the full Critical Bench review. Like most fitness products, Critical Bench is a hybrid product, consisting of several books and a video. The books can be downloaded in PDF format, which can be read on any one of a number of devices, including tablets and smartphones. The video, referred to on the Website as an “online DVD,” can be watched online or downloaded in mp4 format. The Training Logs let you keep track of your progress, and the “online DVD” is a 38 minute video that will show you how to properly use the bench press. The Critical Reload Routine book is a 29 page ebook that stresses the importance of not working out from time to time, and offers some tips on how to schedule your downtime and what sorts of exercises you can do when you’re not lifting. The exercises are explained in detail and the book includes a number of photos to show you how they’re done. This book is exceptional and probably justifies the price of the Critical Bench all by itself. What about the Critical Bench book? This book is a 65 page PDF ebook that focuses exclusively on helping you build muscle via the bench press. There are a number of reasons for this, among them the fact that bench press equipment is common just about everywhere, so you’re not going to have to go looking to find it. The first part of Critical Bench is devoted to theory, explaining Mike’s system of increasing your bench press ability. This involves what he calls “progressive overloads,” where you increase your workloads over time to the point of failure, and high intensity training. I’m seeing a lot of high intensity workouts these days. They emphasize short bursts of exercise rather than prolonged activity. This is thought to help burn fat and build muscle more quickly. Critical Bench emphasizes the importance of rest and recovery, as it is possible to “overtrain.” You want to work out appropriately but then you want to give your body time to recover. For the Critical Bench program, it means that you’ll work out for five consecutive days but then you will take two days off. You can choose the days when you work out and the days when you take off, but you should pick a schedule and stick to it. Critical Bench also emphasizes proper form and the importance of warming up. Lifting weights can be dangerous if you aren’t doing it properly. Furthermore, you may actually fail to build muscle or strength if you’re not exercising correctly. Critical Bench devotes a godo portion of the book to helping you understand proper form and position, along with proper grip. Mike also emphasizes the importance of having a spotter to help you during your workouts. Much of this material is also covered in the online video, for those who learn best by watching, rather than reading. The workouts themselves are fairly straightforward, as this is the bench press. You’re simply going to be doing the appropriate number of reps at the recommended weight and at the recommended speed. Mike also recommends “burnout reps” for those who feel they still need some more exercise after the workout. A final section of the book covers important intangibles such as mindset, preparation and dietary supplements. Critical Bench recommends a few, and links are provided to purchase them online. The Critical Bench program has been around for more than ten years now, and Mike has testimonials from hundreds of satisfied customers. All in all, this program is thorough, well-explained and easy to follow. Charts are provided for weights in the 100 to 500 pound range, which should cover just about everyone who’s interested in the program. If you follow the workout schedule provided, you’ll almost certainly see positive results. Is Critical Bench a scam? No, this is a solid, well-written program by someone who has been working in this field for a long time. The Critical Bench program is more than a decade old and has many satisfied customers. If you’re interested in getting fit, building muscle and adding pounds to your bench pressing ability, you’ll likely find Critical Bench to be a good purchase. Plus, the included Critical Exercise Guide is worthwhile, too.